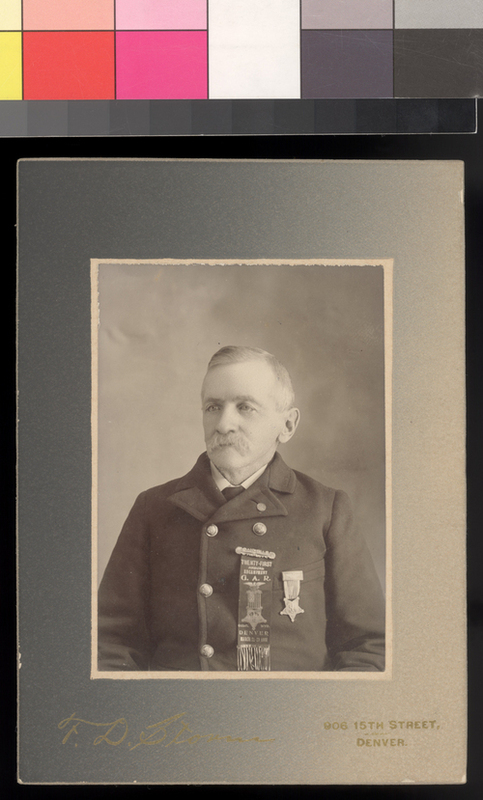 This cabinet card shows Albert Dwight Searl, (1831-1902), a surveyor and Civil War solider. He arrived in Lawrence, Kansas, on September 15, 1854 with the second party of the New England Emigrant Aid Company. A surveyor by profession, Searl went to work laying out the entire city of Lawrence and the city of Topeka, Kansas. He also surveyed the Kansas towns of Manhattan, Burlington, El Dorado, and Osawatomie before the start of the Civil War. In 1861, Searl enlisted as a private in the Eighth Kansas Volunteers and within a short period of time he was promoted to second lieutenant and later a first lieutenant of Company D. During the final years of the war, Searl transferred to the 9th Kansas Calvary before he mustered out of service. After the war, Searl resumed his career by surveying towns along the Union Pacific Railroad and he became the chief engineer for the St. Louis, Lawrence & Denver Railroad and the St. Louis, Lawrence & Western Railroad. As construction on the railroad moved across Kansas and into the Colorado territory, Searl found himself moving from Lawrence in 1872 to Leadville, Colorado. In Colorado, he surveyed the Denver and Rio Grande Railroad and was engaged in a number of mining ventures. On October 20, 1902 Albert Dwight Searl died at his home in Leadville, Colorado, at the age of seventy-one. Burial was in Lawrence, Kansas.